ActionFigureNews.ca reports that the 12th wave of DC Universe Classics figures has been released in Toys R Us Canada stores. This wave includes: Mary Marvel (and variant), Copperhead, Eclipso, Desaad, Dr. Midnight, Spectre (and variant), and Iron; plus the Collect & Connect figure for this wave is Darkseid. Share what toys are being sighted in your area in our Toyark.com Toy Sightings Forum. 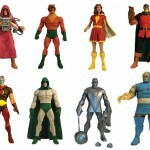 Action Figure Pics has gotten new photos of the soon to be released DC Universe Classics Wave 12. 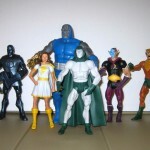 The set includes The Spectre, Eclipso, Iron, Dr. Mid-Nite, Copperhead, and Mary Batson. Darkseid is the piece together figure from the wave. We’ve mirrored a few of the pics, click the headline of the story for the images.